So-called “baby carrots” you buy in the store are not earlier-picked carrots. Usually, they are a sweeter variety and machined down into smaller, rounded, peeled chunks. They aren’t any more or less healthy; they’re simply pre-cut and shaped, and thus usually more expensive. There are true baby carrot varieties but they tend to look like squashed versions of regular carrot shapes. There was one gap in the watermelon conquest of the bed, and some carrots – which we’d given up for dead after a particularly nasty heat wave in September – managed to come back to life. Because they stopped and then started growing again, we had no idea of the timing. So we decided when it looked from the top like there was something worth picking, we’d pick it. Today we did that. ALL HAIL THE AMAZING SURVIVING CARROT OF THE WATERMELPOCALYPSE! Erm…not so much. Now that is a baby carrot. Clearly, we picked it too early. But that top looked pretty long, there’s about to be a “cold” snap (for central Texan values of “cold”), and you never know when the watermelons might’ve reached over to strangle this desperate survivor anyway. There are a couple of other struggling little carrot tops in the garden so maybe one of those will make it, but I’m dubious. Peo and I washed, cut, and ate the infant carrot. And by “ate” I mean “nibbled carefully so as not to lose it in our teeth”. It tasted vaguely carrot-like. Peo declared it “not very filling”. Indeed. So much for that gardening experiment. 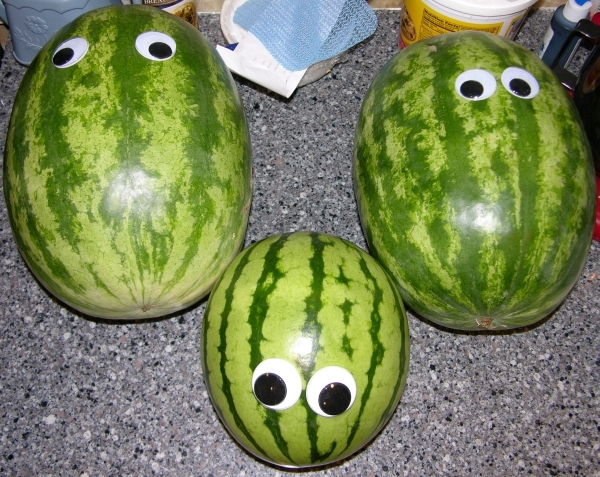 Perhaps one day there will be melons…green melons…absorbing us into their domain…melons made from peeeeopllllle!